As one of our Guest Services Agents you will be the first point of contact for our prospective guests: people from around the world who are looking for the best way to spend their time while in Toronto. You will field their questions about our tours and rentals, make recommendations, help them with bookings and administer our bike rentals. You will also provide support to our tour operation, helping to ensure that everything goes smoothly and that our guests have a fantastic experience. You love helping people. You know how much is at stake for our guests – that they are choosing to spend time & money with us – and you want to help ensure that they feel welcome and that they make the most of their time while with us, and while in the city. You’ll connect with our guests regularly by phone, by email, online, and in person, so strong communication skills are essential. You will be trusted to work independently while also contributing to our team. You are an energetic self-starter with good judgement who does the right thing even when no one else is watching. This is a challenging and rewarding role in a dynamic environment, requiring an ability to stay organized and focused. 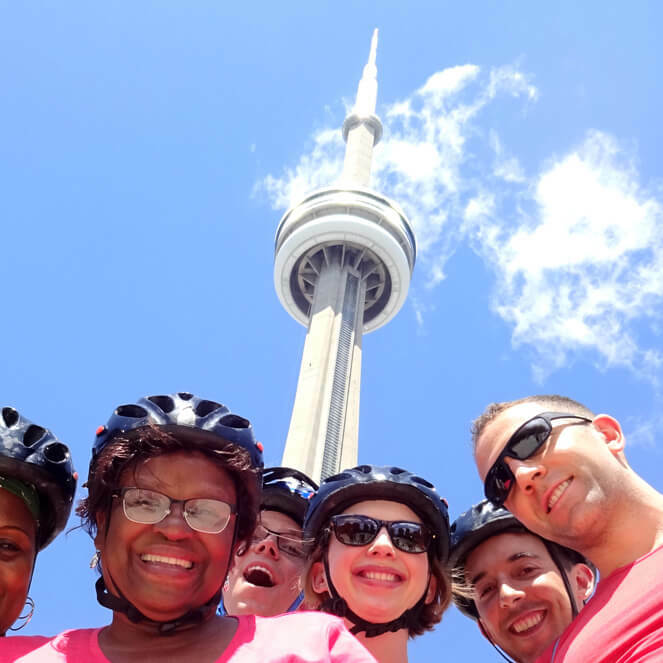 Our Guest Services Agents come from a variety of backgrounds, but they all love helping people, live in (and love) Toronto, and are strong communicators who can stay organized in a fast paced environment. If you are driven by your love of your city, and your desire to help others experience the best of Toronto then we want to talk to you! Or if you know someone who’d consider this their dream job – do them a favor and pass it along! Our Guest Services Agents get meet interesting people from all over the world, work on a dynamic team and have a ball exploring our great city. This is a part-time contract from May – early October 2019. Work is usually on set days/shifts with the possibility of mornings and/or afternoons, and with some work on weekends and holidays. Pay is a competitive wage. Please send a resume and cover letter to jobs(at)torontobicycletours.com. We look forward to hearing from you!